A valuable and new service is coming soon to a number of Kootenay communities. Community Paramedicine will soon be available in New Denver, Nakusp, Edgewood, Kaslo, Riondel, Salmo and Winlaw. Paramedics have been hired and are currently undergoing training for the new service. The communities of Fruitvale and Rossland will be introducing the service in the fall/winter of 2017. The two goals of the program are; to contribute to the stabilization of paramedic staffing in rural and remote communities and to help bridge health service delivery gaps in the community, identified in collaboration with local primary care teams. For seniors in rural and remote communities this service will help them age in place, reduce isolation and prevent hospital visits. Some of the services that they are able to provide are checking blood pressure, assisting with diabetic care, helping to identify fall hazards in your home, medication self-management assessment, post-injury or illness evaluation, and assisting with respiratory conditions. Your community paramedic may not diagnose a medical condition, prescribe medications, or develop a treatment plan. 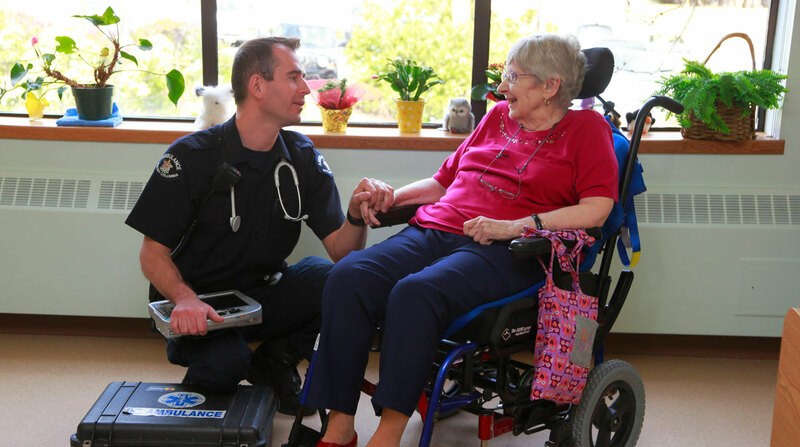 If you feel you or someone you know would benefit from the services of a community paramedic, please consult with a physician, community health nurse or nurse practitioner about a referral. Talk to a doctor about how this new service can work for you, or someone you care about. Help keep rural seniors in their homes and communities! Follow the link below to the BC Emergency Health Services website for more information.